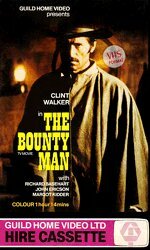 This one's about an embittered widower who takes up bounty hunting as he searches for the man who ran off with his wife and then deserted her. "The same killer" is a young outlaw who's got it together with a saloon girl who tags along after Clint Walker has snatched him from a rough township. He's got no gang, though there is a bunch of roughnecks who want to relieve Walker of his prisoner.